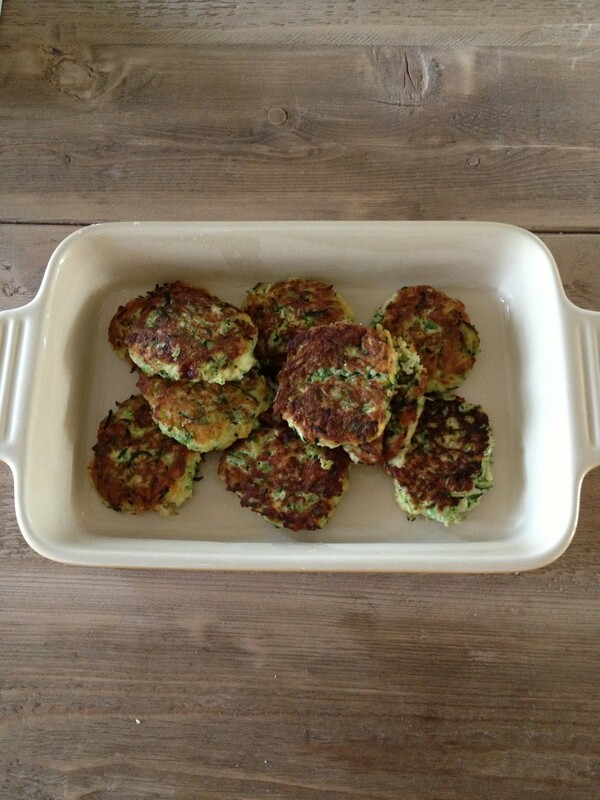 Zucchini Cakes | Whole Food. Real Food. Good Food. My kids love zucchini. It is a very mild vegetable with a pleasant texture. I usually cut it up into sticks for them as a snack but wanted to try something new tonight. We made zucchini cakes and they were delicious! Full of flavor with a wonderful texture. Everyone loved them and my 3-year-old asked me to make more. Here is a breakdown of the recipe and why these cakes are so good for you! Zucchini: Lutein and Vitamin C, both found in zucchini, are good for the eyes and help ward off cardiovascular problems; anti-inflammatory properties that can help reduce asthma attacks; high in phosphorus, magnesium and manganese, promoting strong teeth, bones and capillary networks; reduces risk of colon cancer and multiple sclerosis; can help lower cholesterol and blood pressure; hydrating food (water content of more than 95%). Himalayan Pink Salt: Free of bleaches, preservatives or chemical additives, it has a natural pink color and 84 minerals and trace elements such as: calcium, magnesium, potassium, copper and iron. Regular consumption of Himalayan Pink Salt provides essential minerals, trace elements, balances electrolytes, supports proper nutrient absorption, eliminates toxins, balances the body’s pH, normalizes blood pressure, and increases circulation and conductivity. It can also assist with relief from arthritis, skin rashes, psoriasis, herpes, and flu and fever symptoms. Green Onions: Reduces inflammation; protects against colon cancer; rich in quercitin, an antioxidant that acts like an antihistamine—extremely important for seasonal allergy sufferers. Quercitin also lowers blood pressure and wards off heart disease. Garlic: Aids in weight loss & digestion, anit-fungal, boosts immune system, “Garlic is one of the foods that specifically inhibits cell growth in certain cancers. Dr. Beliveau’s laboratory was able to test crude extracts from different foods on the cells of several different cancers. Garlic, onions and leeks rank high among the most effective foods for the following cancers: brain, lung, prostate and breast.” – David Servan-Schreiber, MD, PhD. Eggs (purchase organic if possible): Packed with vitamins A, D, E, B2, B6, B9, iron, calcium, phosphorous, potassium and choline. When shopping for eggs, keep in mind pasture raised, free-grazing hens produce a superior quality egg and are less prone to salmonella contamination. Free hens lay eggs with 3 times more vitamin E, 7 times more beta-carotene, 1/3 less cholesterol, 1/4 less saturated fat, 2/3 more vitamin A, and 2 times more omega-3 fatty acids. Almond Flour: High in protein, low in carbohydrates and low in sugar; lowers bad cholesterol (LDL); protects artery walls from damage; promotes bone and teeth health; lowers the rise in blood sugar and insulin after meals; almonds help with brain function. Ghee: Ghee is made by a simple process of gently simmering butter to remove potential allergens such as casein and lactose. What remains is the pure butter oil, which promotes good helath and longevity. Ghee is a natural source of CLA (Conjugated Linoleic Acid) and the important fat-soluble vitamins A,D and K2 that are critical for maintaining good health. CLA slows the progress of some types of cancer and heart disease and appears to help reduce body fat and increase lean muscle mass. 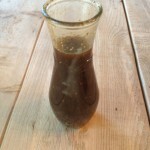 Coconut Oil: Strengthens immune system; boosts key mineral absorption (calcium and magnesium); anti-fungal and antibacterial; provides long lasting energy; great for skin and hair (internally and topically); reduces risk of atherosclerosis and heart disease; reduces risk of cancer and other degenerative conditions; helps control diabetes; improves digestion and nutrient absorption; supplies important nutrients necessary for good health; promotes weight loss; functions as a protective antioxidant; healthiest oil for cooking. 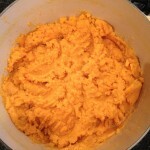 Once grated, place in a bowl and toss in the salt. Allow the zucchini to sit in the salt for at least 10 minutes. Then, extract any excess water from the zucchini. The easiest way to do this is to place the grated vegetable in a large piece of cheese cloth and wring it out. I did not have this available, so I used a colander and pressed the zucchini against the sides with force, making the water drip out. Return the zucchini to a large bowl and combine with the almond flour, green onions, garlic, egg and baking powder. Once everything has been mixed, form cakes of about 2 to 2.5″ in diameter out of the mixture. Place a large skillet over a medium-high heat. 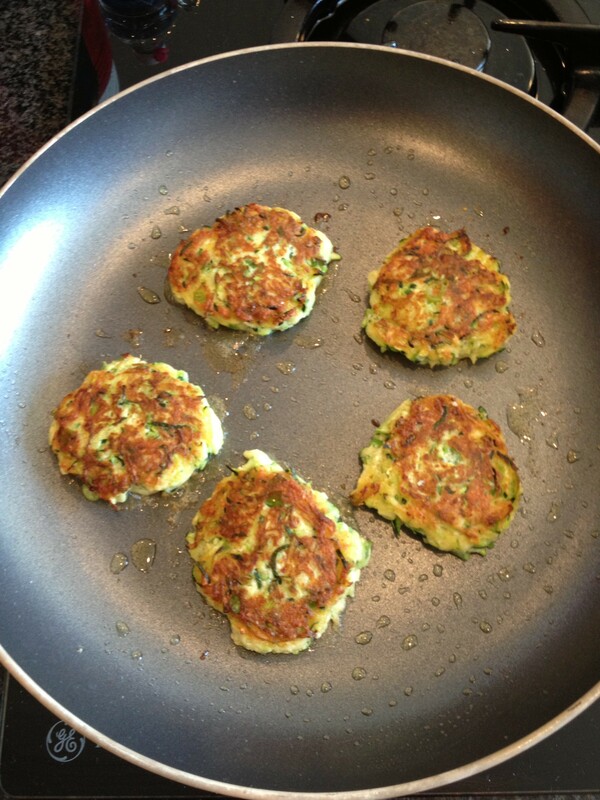 Add coconut oil or ghee, just enough to coat the surface of the skillet and then place the zucchini cakes in the pan. 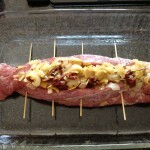 Allow them to cook for about 3 to 4 minutes on each side, just enough so that they are crispy and golden brown. Purchase all organic ingredients if possible. Recipe adapted from paleolifestyle.com. 1. Begin by using a large-scale grater to grate your zucchini. 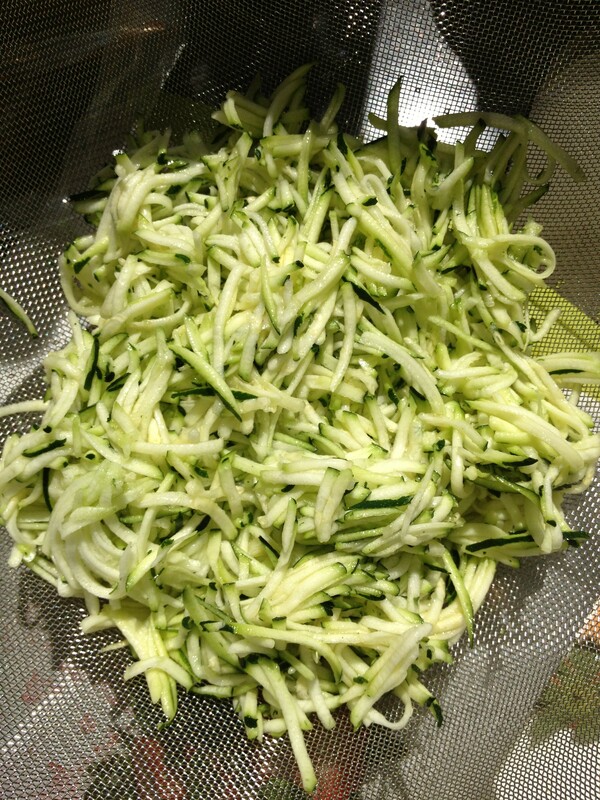 You want to avoid creating small, thin strands, as the zucchini could get mushy upon frying. 2. Once grated, place in a bowl and toss in the salt. Allow the zucchini to sit in the salt for at least 10 minutes. 3. Extract any excess water from the zucchini. The easiest way to do this is to place the grated vegetable in a large piece of cheese cloth and wring it out. I did not have this available, so I used a colander and pressed the zucchini against the sides with force, making the water drip out. 4. Return the zucchini to a large bowl and combine with the almond flour, green onions, garlic, egg and baking powder. 5. Once everything has been mixed, form cakes of about 2 to 2.5″ in diameter out of the mixture. 6. 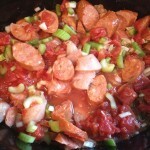 Place a large skillet over a medium-high heat. 7. Add coconut oil or ghee, just enough to coat the surface of the skillet and then place the zucchini cakes in the pan. 8. Allow them to cook for about 3 to 4 minutes on each side, just enough so that they are crispy and golden brown.